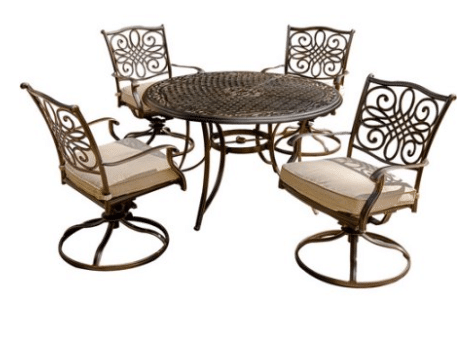 Are you looking for a patio dining set with 4 chairs for your outdoor space. The sets in this article will give you some ideas to think about. There will be three styles, with variations of two of the styles. 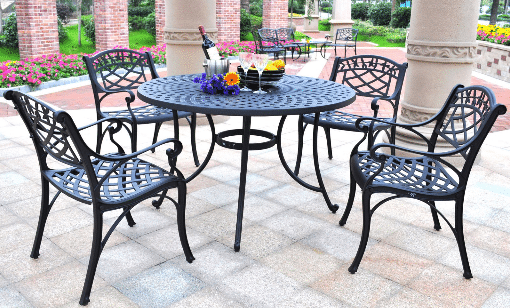 All of these sets will be made of metal with a powder coated finish for outdoor durability. You will have to choose between a traditional classic look, straight chairs swivel chairs or a complete set with cushions and matching umbrella with stand. Now lets look at the details for each set and see what will work best for you. This set will have a cast aluminum frame with a powder coated charcoal black finish. Chairs will have a cross weave design for the seat and back. The table will ave a similar design in the top. Round table will have a hole for an umbrella and lower leg brace will offer more support for table and umbrella. Table is 42 inches across and 30 inches tall. When taking care of this set, do not use harsh chemicals as they will damage the powder coated finish and start your set to fade. A mild soap and water rinse is all that is needed to keep your set looking new. This is the same style as the set above. 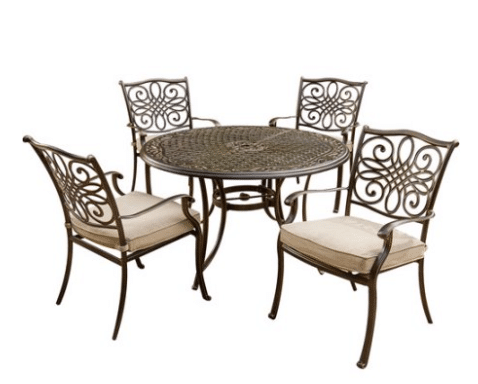 This patio dining set with 4 chairs will have a 48 inch table for more room for your setting your meal out for serving. Little care will be needed with this set, if you have a heavy stain or bird droppings, use a mild soap and water mixture to clean. This classic looking set is available in three colors green, red and white. The chairs will have some motion with the frame design. All steel construction with a non toxic powder coated finish will help protect your investment. Chairs have a steel tube frame that is powder coated in a white color for all three seat colors. The tube frame will allow for some front to back motion for seating comfort. Each chair will support 250 pounds and have a seat height of 15 inches. Table will have hole for umbrella with center support giving extra support. The table is 40 inches across and 25 inches tall to fit most of your meals and drinks. Easy care of a mild soap and water mixture, watch for scratches, they will start to rush quickly. 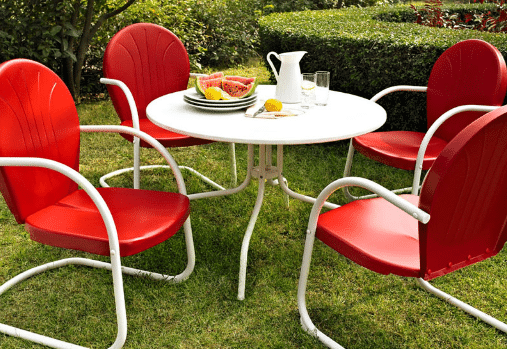 For more of this type of this patio furniture, see my post here. 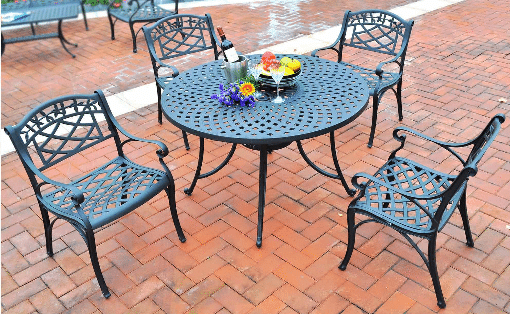 The Hanover traditions collection is a cast aluminum set with a powder coated finish. The lower end set will have four straight leg chairs with out motion and a 48 round table. The chairs will support 250 pounds each and have a scroll design for the back. A seating cushion with a tan polyester cover and polyurethane foam cushion will supply comfort for seating. Chairs cannot be used without cushions as the seat of the chairs are 3 bars supporting cushions. Cushions are UV resistant and are treated to stop staining. Straps hold cushions in place while sitting or windy conditions. Round table will be 48 inches across and 28 inches tall. The top will have a lattice type of design and a hole for umbrella. Leg support will also have some support for your umbrella. Care of your set will be a simple mild soap and water. Use a rag to remove stubborn stains. Do not use any harsh chemicals as they will damage your powder coated finish. Very similar in design as the last set, this set will have swivel chairs with back and forth motion. The chairs have a round base that is attached to the seat portion with a spring type bars to give forward and back motion, not a true rocker. Must follow assembly instructions closely when attaching seat base to chair base. The spring bar is easy to reverse and chair will not operate properly if not installed correctly. Same table as above set 48 inches across and 28 inches tall. Same cushions as above set only available in tan at this time. For those looking to purchase every thing together, this complete matching set will be the one to buy. Color matching market umbrella and stand are included with the set described above. The same swivel chairs are included in this set with the tan cushions. Same 48 inch table is included in this set. All aluminum nine foot umbrella is color matched to the tan cushions. It has a tilt feature and crank for raising for shade. The pole is 1.5 inches. Base will have the same lattice design as the table and has a screw to hold the umbrella in the shaft. The 20 pound weight will help keep your umbrella stable in most modest winds. It is 20 inches across. 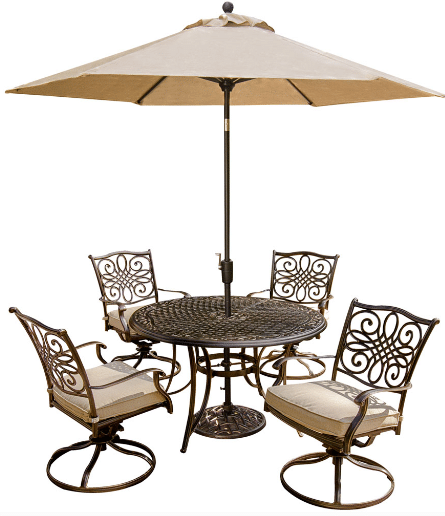 If you are looking for a classic looking patio dining set with 4 chairs or a full set with umbrella and stand, one of these sets will be in your future. Each set will have its own advantages in outdoor decor and comfort. I like getting every thing matched in the Hanover Traditions for under $1200. Many will like the classic never out of style Griffen set, cost is more than when first introduced in the 50's when this set was under $25. The three available colors will match most outdoor decors. If you would rather have a resin wicker dining set, see my information in this post. I hope you have found this article full of helpful information, if you have any questions or comments about my content, send me a note below and I will get back to you shortly. This is a great set for those who like the old time look and if you add your own style of cushions, you will make your own decor statement. Just watch for rust on this set. Having the right look at the right price is what makes a great outdoor space. You are the only one that can determine what you can afford at any given time. Any space can be filled with the right budget. Another outstanding review as usual. Ok, I liked your recommendations but I have one small problem – space. My garden hook is small so it is a challenge trying to find a table that is cute and elegant and small at the same time. The one I like is the Crosley Sedona set with 42 inch Table, but I was wondering if there is a smaller size to it? Or is there a set that you can recommend? I would love your advice as you seem so knowledgeable in things ‘outdoors’. Thanks so much. The Crosley set is available in pieces also, I have done an article on the chairs and small side table. Just follow this link for more details on the retro patio furniture. Wow so much to choose from. I really liked the look of the wrought iron. It brings its own elegance and its so functional and utilitarian. IN that it truly holds up. And mostly I am at a space where I want to sit in really comfortable chairs. And these sets look like they make the grade. It’s so lovely to be able to be outside, isn’t it? I liked the Sedona set also. I have a bistro set in the wrought iron on the deck at my lake house. Sit their this Sunday morning with a cup of coffee looking out at nature. What a way to relax and start your day. The Sedona sets are just a heavier metal set with more design. They do have some options on table size that will make a decision tougher. I really liked these sets you suggested here, but my favourite is the Hanover traditions collection – which not only looks very nice and comfortable (in my opinion) but also “stable”. The swivel option looks like it would be too awkward and personally would make me nauseated! Also these sets are easy to take care of which is great. Can you get the Hanover Traditions collection with the umbrella for the same price or does it cost extra? The umbrella and base does increase the price, what you will get will match the material and design of the patio furniture. I do have swivel chairs on my front porch, they are very comfortable and only swivel when I make them.